HTLJ is proudly co-sponsoring the Corporate Intellectual Property Strategy Conference (CIPSC) 2018 Law Student Writing Competition with Unified Patents! Prizes: 1st Place - $1,500 and opportunity to publish and/or present at CIPSC 2018. Description: Lawyers are required to make important decisions for their clients every day. Whether it is a complex issue regarding a multi-million dollar transaction or a routine matter concerning an employee agreement, these decisions require significant attorney time and resources. Advances in artificial intelligence (AI) and machine learning technologies have the potential to help lawyers and their clients make these important decisions, streamline legal work, and reduce unnecessary transaction costs. Identify a specific legal problem facing intellectual property attorneys or the broader high-tech industry and explain how AI and machine learning technologies can be leveraged to solve that problem. Eligibility: Current law students or 2018 graduates from ABA-accredited law schools. Submission Rules: Contestants enter by completing the Essay Submission Form. By participating, contestants agree to comply with all Contest Rules. Submissions should be between 2,500 and 5,000 words in length, well-sourced, and use footnotes and Bluebook format. The deadline for entry is October 15, 2018. Papers received after the deadline may be considered at Unified's discretion. 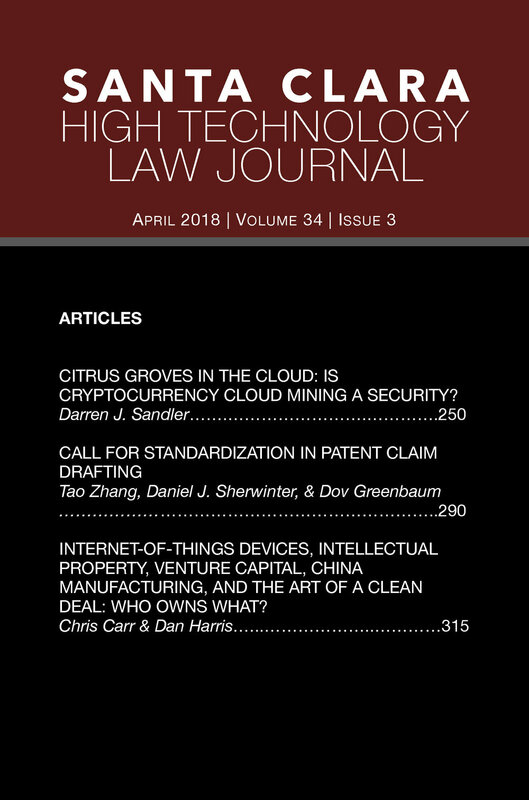 The Board of Editors proudly welcomes both summer and fall associate classes to the Santa Clara High Technology Law Journal. Congratulations, and thanks to all who participated in our writing competitions!